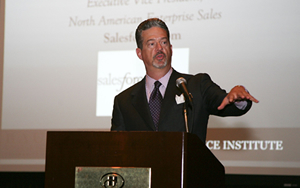 Salesforce.com Executive Vice President Gary Hanna noted the importance of giving back during his keynote speech at the 2008 PES Graduation and Induction Ceremony. Graduating members of the program were recognized at the event for their achievements, and new members were welcomed into PES, which is a branch of the Sales Excellence Institute at UH Bauer. The program gives students the opportunity to receive real-world business experience by selling sponsorships, career fair booths, advertisements and partnerships. The keynote speaker at the ceremony was Gary Hanna, who is executive vice president at North American Enterprise Sales for salesforce.com, the software company that PES students use for customer relationship management. 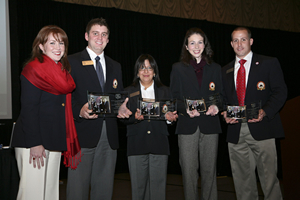 PES graduate Jessica Bondurant, second from right, stands with her classmates and teammates, who placed third in a national sales team competition. Pictured (from left) are PES clinical professor Amy Vandaveer, Jonathan Page, Alisa Hemker, Bondurant, and Jason Evans. PES chose to make the switch to salesforce.com in July 2005, and the program was up and running in less than a month. Today, there are 250 student users and more than 3,000 companies in the system. Hanna offered advice to PES graduates and inductees, stressing four concepts they should follow throughout their career and life — always sell for the market leader, sell disruptive technology, keep your integrity, and give back. Students will have more fun and an easier time if they are selling with the market leader and if they are selling for a company that is changing the way things are done in their respective industry, he added. The program also gives the power of resilience, the power to listen and the ability to uncover problems, Bondurant added.